We solve problems. We believe in the jury system and take pride in our ability to simplify complex information and communicate it effectively and persuasively. We also recognize that an acceptable solution sometimes resides outside of the courtroom. We will help you find the best, most cost-effective resolution to your problem. James R. Boston, Jr. (1989-2018) and Matthew B.E. Hughes (2004-2018) have been AV rated by Martindale-Hubbell, a LexisNexis service. Mr. Boston has been listed in The Best Lawyers in America in the category of Medical Malpractice - Defendants from 2007-2019. The Best Lawyers in America is published by Best Lawyers®. Attorneys James R. Boston, Jr. (2010-2013), Matthew Hughes (2013) and Melissa Khan (2010-2011) have been included on a list of Houston's Top Lawyers by H Texas magazine, published by Bayou City Publishing. Boston & Hughes, P.C. has been listed in Best's Directory of Recommended Insurance Attorneys, published by A.M. Best Company, from 2004-2019. Attorney James R. Boston, Jr. has been listed in Super Lawyers from 2008-2018 in the category of Personal Injury Defense - Medical Malpractice. Super Lawyers is a service of Thomson Reuters. 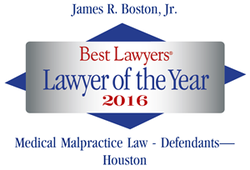 Attorney James R. Boston, Jr. has been named Best Lawyers® "Lawyer of the Year" 2016 Medical Malpractice - Defendants - Houston. Attorney James R. Boston, Jr. was named Best Lawyers® "Lawyer of the Year" 2014 Medical Malpractice - Defendants - Houston. Attorney James R. Boston, Jr. has been listed in the Bar Register of Preeminent Lawyers from 1995-2018. The Bar Register is published by Martindale-Hubbell, a LexisNexis Service.